No extra letters in the wordplay here, but extra words in a thematic number of clues. From the title, that was obviously going to be twelve clues. 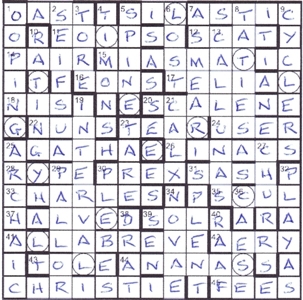 Each of these extra words lost a letter, the resulting letters forming an anagram with the lost letters forming a hint. Another half hour later, with the grid about half full, HERCULE POIROT was trying to make himself known in the leading NW–SE diagonal, and not long after that the whole puzzle fell into place. Although I read the book many, many years ago, I have seen the film with Albert Finney as Poirot on more than one occasion. Although the Branagh version was good fun (outrageous moustache included), I prefer the 1974 version. I must say, however, that I’m surprised that “Spoiler Alert” wasn’t signposted in the preamble, after all it’s a current movie and we know how we are excoriated for mentioning current things! Moreover, I know of a few people (one well-read) who don’t/didn’t know the ending. The extra words led to the first names of all the… let’s call them suspects. I could just about recall all of them, with the exception of Count Rudolph Andrenyi and Mrs Hubbard (Lauren Bacall in the original and Michelle Pfeiffer in the current) whose first name turns out to be Caroline (cornelian* – n). One of the names was revealed by my favourite clue at 45ac Those spilling [Perrier] water after pay ends (4) leading to FEET, the character being Pierre Michel. The remaining letters, Eastern State led to ORIENT EXPRESS which needed to replace Poirot in the diagonal with twenty new words appearing and an E slotting in the central barred-off square. With all this thematic material, the number of 4-letter entries was totally understandable. This puzzle was even more entertaining than the film (well, almost). Hercule, the train, and all the characters were there, not forgetting Poirot’s LITTLE GREY CELLS. Thanks for the ride, Twin. This entry was posted on 5 January 2018 at 4:00 pm	and is filed under Solving Blogs. Tagged: Jury, Twin. You can follow any responses to this entry through the RSS 2.0 feed. You can leave a response, or trackback from your own site.